252 pages | 1 B/W Illus. How does the toxicity associated with particular parenting styles affect attachment? How do the contaminated views of themselves that children of poisonous parents have affect their relationships into adulthood? Like physicians, clinicians do not want to amputate, but they sometimes find it necessary in order to preserve the health of the larger system. 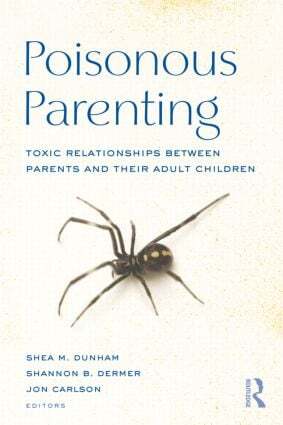 Poisonous Parenting shows clinicians how to recognize the effects of poisonous parenting in adult children and how to heal the scars created by parents' toxic attitudes and behaviors. Readers will come away from the book understanding ways to counteract the effects of poisonous parenting so that clients can recover and lead a healthy life. They'll also learn techniques for determining when a relationship can be salvaged, when to proceed with caution, and when to disconnect in order to keep the poison from spreading. Dermer, Dunham, Introduction. Dermer, Dunham, Poisonous Parenting. Robey, Sori, Compassionate Parenting: The Antidote to Poisonous Parenting. Farber, Siegel, Parental Presence: An Interpersonal Neurobiology Approach to Healthy Relationships Between Adults and Their Parents. Goldstein, Thau, A Brain-based Understanding From the Cradle to the Grave. Dunham, Woolley, Creating Secure Attachment: A Model for Creating Healthy Relationships. Sperry, Couple Relationships. Horn Mallers, Englar-Carlson, Carlson, Father-son Relationships. Jordan, Disconnection and Parenting: A Relational Cultural Perspective. Durham, Addressing Poisonous Parenting within the African American Community: A Systems Approach. Olund, Honor Thy Parents? A Religious Perspective on Poisonous Parenting. Hargrave, Saving Oneself: Forgiving the Poisonous Parent as an Act of Kindness to Oneself and Future Generations. Dermer, Dunham, Helping Clients Become Compassionate Parents, Partners, and Friends.